Dozens of solar power installers exist to serve your needs, but do you know which one is perfect for your project? In this blog series, we’re sharing 38 questions you should ask potential solar power companies before you hire them. Granted, there are dozens of more questions we could add to this list, but these are the most popular questions we get at West Coast Solar. 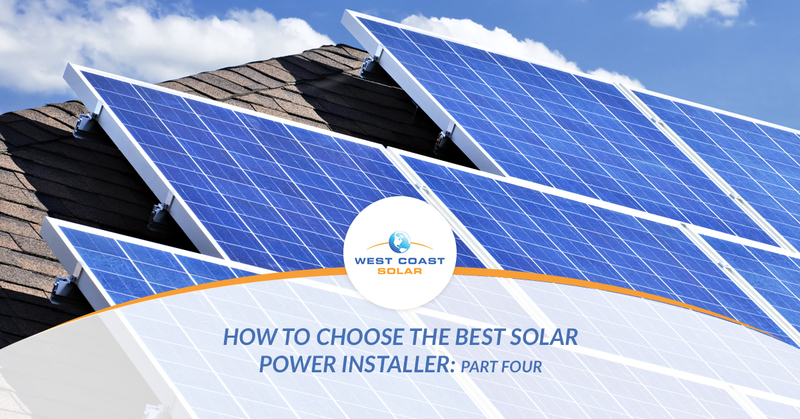 Nonetheless, in this post, you’ll discover the four main areas of focus to consider when making your final decision on a solar power installer. Are you ready to make the switch to solar power? Give West Coast Solar a call today! We’ve been serving Sacramento, San Jose, and the surrounding areas for years. We keep solar simple! Otherwise, continue reading this blog post to learn more! There are a lot of factors to consider when choosing the best solar power installer for your project. Whether you’re looking to add a solar system to your home, business, or rental properties, it’s important to do your research before hiring the first solar company you find online. Here are four main areas you want to consider when searching for a solar power company to hire. There are a variety of solar power companies available for you to use. You will find companies that subcontract their design and installation. You will also find companies that are turn-key, which means from first contact to final walkthrough you’re working with one company. Then you will find a mixture of both. The important aspect to focus on in this category is their expertise paired with experience. You will find solar power installers with a range of expertise and experience. Consider asking for professional certification proof. Some companies started solar before certifications were a thing, so you may get a few that don’t have any. However, asking for certifications prompts the company to prove that they know what they’re doing. You want to choose the solar company with the most knowledgeable expertise alongside the best experience for your project. As the solar industry continues to expand, more professionals are joining the ranks of designers, installers, and more. You want to find a solar company with a track record that proves its ability to deliver on its promise. As you look for a solar company, you may encounter various professionals like contractors, roofers, real estate agents, and more offering solar systems as an extension of their business. We’d suggest you do your due diligence on their ability to deliver. The best choice is to go with a company that’s been focused solely on solar for a while. Before you hire a solar company, you need to know if they’re licensed in your given municipality/state and if they’re insured properly to protect, them, you, and their craftsmanship. General licensing for solar power installers can include general contractor, electrician, home improvement, and more. Insurance is also important, and you should request a policy number to make sure you’re protected from any accidents, damage, or incompetent work. What does the industry and the solar company’s customers say about them? This information is relatively easy to find online, and it’s worth taking the time to do the research. You will want to dig into review ratings, the context of those reviews, and how long the company has been around to truly determine if they’re the right company for you. You can also ask potential solar companies for customer references to call and discuss their experience with said company. This way you can get information from the internet and in-person customers. At West Coast Solar, we understand that everyone has their reasons for making the switch to solar power. Finding the best solar power installer for your project can mean the difference between a positive and a negative experience. From first contact to final walkthrough, you need to know you made the right decision. What if you need to file a claim through your insurance to fix a damaged solar panel? You want a company that will honor their craftsmanship. Both of these factors and more all play a role in your decision. At West Coast Solar, we’re proud to offer excellent customer service, the best components on the market, and an unmatched drive to satisfy our customers. With the 38 questions from this blog series, we’re positive you’ll be able to find the best solar power installer for your project. Instead of doing all the research, call us today! We’ve served Sacramento, San Jose, and the surrounding areas in California for years, and we’re ready to serve you.